Is it indulgent to spend a weekend (or two) traveling between Olympic Peninsula Wineries, drinking red wine and eating chocolate? Or is it good sense? It’s no secret that moderate consumption of red wine is good for your health – it is believed to lower the risk of heart disease. Well, it has come to light that the same is true for dark chocolate. Antioxidants, flavonoids, resveratrol? Let the doctors and scientists study the nitty gritty of why red wine and dark chocolate can help our hearts. We’ll just do as the French have always done – consume them and smile. Six Washington State Wineries on the Olympic Peninsula are pulling out their best red wines and pairing them with fine chocolates during the weekends of February 5-6 and 13 – 15, 2010. You may purchase tickets to these festive events and taste at all six wineries for a mere $25 (includes a souvenir wine glass), or taste at individual wineries for $5 each. 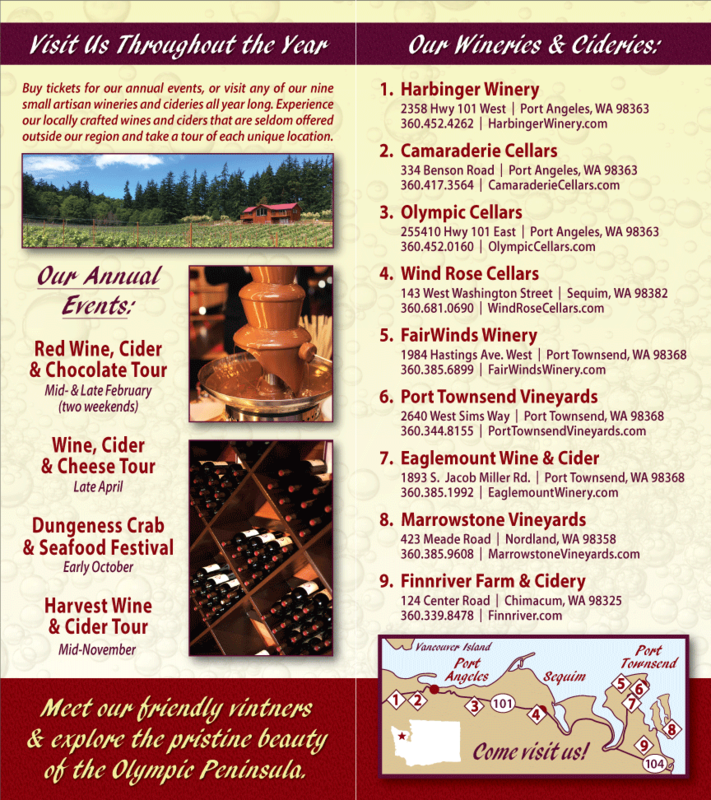 There is a red wine for every palate at Harbinger Winery in Port Angeles, and a variety of chocolates to match them. Fruit wines, hearty reds and crisp blushes are all here. Camaraderie in Port Angeles will pair their 2006 gold medal winning merlot with merlot chocolate dipping sauce, Molly Baby chocolate cookies and Princess Valiant chocolates. They’ll pull out other reds as well: cabernet sauvignon, cabernet franc and blends. Head to the Black Diamond Winery, in the foothills of the Olympic Mountains near Port Angeles, for tasty Raspberry and Strawberry wines. Be sure to savor the chocolate truffles between sips. Those of you who enjoy a little spice in your life may want to head straight to Olympic Cellars, on highway 101 between Sequim and Port Angeles. CBC chocolatier Peter Crabtree has created spice-embedded chocolates to enhance the reds at Olympic Cellars. Your taste buds will tingle. FairWinds Winery in Port Townsend will be pairing their award-winning Port O’Call with rich chocolate flowing from “the tallest known chocolate fountain in captivity”. Also in Port Townsend, Sorensen Cellars pairs reds with assorted chocolates and truffles made by Sequim chocolatier Yvonne. Be sure to try the two new releases: a Cabernet Sauvignon and a Malbec. You can consider it romantic or fun to head out for a weekend of tasting chocolates and wines from Washington State. Or you can consider it an integral part of your health care. How you spin it is up to you. No matter what, we feel certain you will enjoy it. With Valentine’s Day fast approaching, as well as a delicious three-day Red Wine & Chocolate weekend on the North Olympic Peninsula, here’s a quick, fun quiz you can take to discover your chocolate personality!